So many times as a coach, one of the most frustrating mis-tackles that we see our players make is that tackle when the ball carrier is running own the sideline, and all he really needs to do as a defensive player is force him out of bounds. In this video blog post, I am sharing a drill that we try to run in every practice – it’s called the Side Line Tackle Drill. 1. Nose It Up – usually, we talk about the far number being the aiming point on the side tackle, or a side up. On a Side Line Tackle, where we have the boundary as our 12th defender, now we tell the kids that they can “nose it up” a little bit more heavily. You don’t need to get your head across quite as much because he’s got nowhere to go. So “nose it up” makes the aiming point the near shoulder pad of the running back. 2. Use the 12th Man – In this tackle drill, the biggest point to remember is that you have a 12th man on the football field. And that 12th man is the sideline that the ball carrier is straddling as he runs. Use it to your advantage! 3. Hip Pocket Relationship – you still want to stay in a good, heavy hip pocket relationship – maybe even a little bit heavier to his inside than you would in a normal Side Tackle. This is because the most dangerous cut is the cut back. Build a wall and keep that running back or wide receiver on the outside edge between your body and the side line. Make him try to split the two of you, and push him out of bounds. 4. Force the Ball Carrier Out Of Bounds – Make sure that your players have an opportunity to force that ball carrier out of bounds. When you are doing this drill, always use the side line boundary. – Line up the ball carrier 2 – 3 yards inside the side line. – Line up the defensive player at approximately 15 yards between him and the ball carrier. – Start the ball carrier down the side line as the defensive back starts towards the side line. 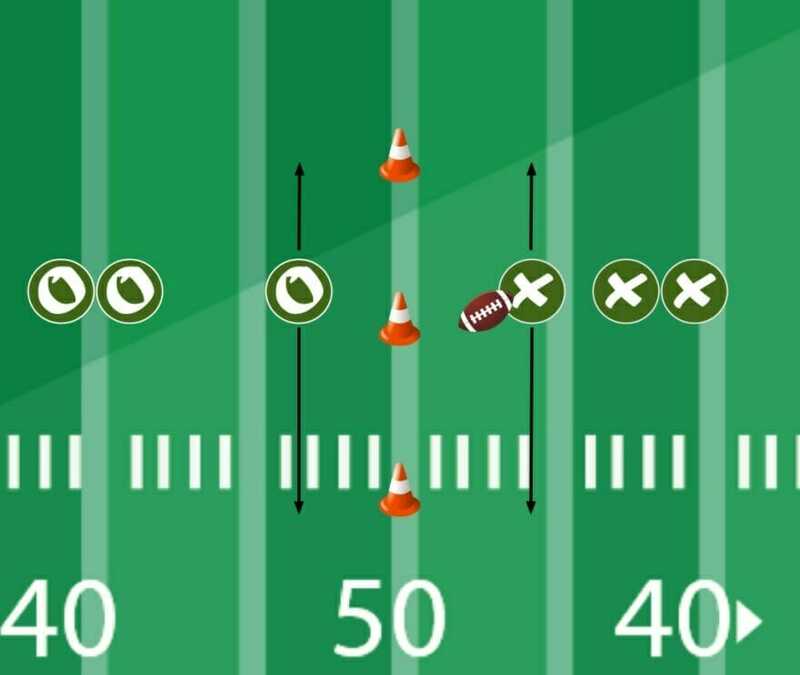 – The ball carrier will try to run down the side line, and the defensive player will then nose it up and drive the ball carrier out of bounds. 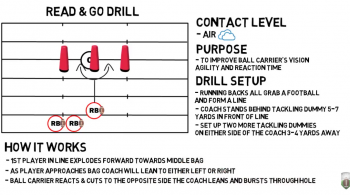 – After your players are comfortable with this phase of the drill, the next phase will be the have the ball carrier work on running down the side line and cutting back in. For more great side line tackle drill tips and much more, be sure to Become a Fan on Facebook! You can also Follow Me on Twitter and Hangout with Us on Google+! 2 replies to "Breaking Down The Side Line Tackle Drill"
This a great drill which can be used at all levels.